$249.99 & FREE Shipping on orders over $59. $249.99 & FREE Shipping on orders over $59 $35. 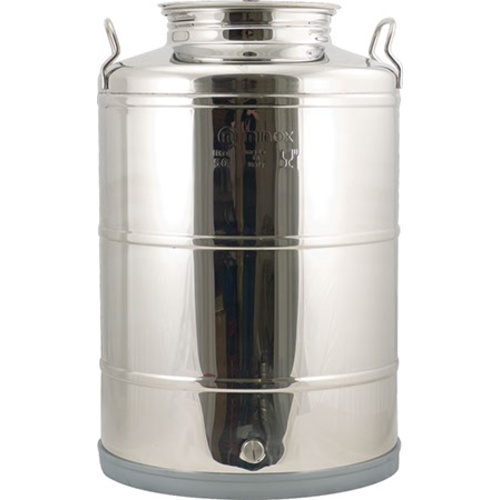 Stainless storage tanks for wine that include handles and a screw-top stainless lid with seal. Note that these are economy grade tanks and are a perfect fit as settling tanks, for short term storage, for racking out of barrels, for blending tanks, etc. but they are not great for long term storage. The problem is that the lids have molded threads and these cannot be trusted to for long term storage of high quality wines. Please see our line of German made Speidel storage tanks ranging from 13 to 475 gallons for long term portable storage solutions. Made from 304 type stainless steel, these tanks come with a 7.5" opening on top with a screw-top lid that seals against a gasket. There is a 1/2" BSPP female coupler on the bottom, designed to work with the ball valve listed in the You Might Also Need section below. Please Note: These tanks DO NOT come with a ball valve. If you would like to purchase Ball Valves for this tank, please reference the You Might Also Need section below.